The Bloodhound is a large scent hound originally bred for the purpose of tracking and trailing human beings. Often recognized for its long ears and wrinkled face, the Bloodhound has a keen sense of smell and an extraordinary ability to follow a scent - even scents that are days old. This makes the dog an excellent aid and an important part of a search and rescue team. Choosing to add a furry friend to your growing household is a long-term commitment, and picking a breed that fits your lifestyle presents the key to a happy home. With over 160 American Kennel Club-recognized breeds, that decision can seem overwhelming. We're here to help you meet the breed that's right for you. If you want a loyal pet that's good with the family and other pets, find out everything you need to know about the Bloodhound. A scent hound originally bred to track deer and boar, this breed has evolved to trailing humans. These dogs are called Bloodhounds not because of their abilities but due to early breeders working intensely to keep their bloodline clean. An active animal in law enforcement, the Bloodhound's scenting ability is so trusted that it can be used as sufficient evidence in the courtroom. This is a very active breed, not the lazy dog you may have seen portrayed on The Beverly Hillbillies. 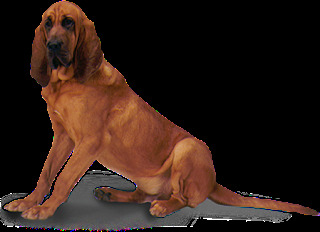 Bloodhounds are working dogs and need long daily walks or runs. Bloodhounds are not suited for apartment living. They do best in a home with a large fenced yard. Bloodhounds are pack dogs and will enjoy the company of other dogs. A cat will do in a pinch. Bloodhounds slobber and shed. Keep baby wipes or hand towels on hand throughout the house, and brush them weekly or more often if needed. Bloodhounds love and are extremely tolerant with them. Teach children how to treat a Bloodhound properly and supervise play between them. Bloodhounds may be too large for toddlers; they can knock them down with a single swipe of the tail. Bloodhounds need a fenced yard. This is not an option but a necessity. If they come across an interesting scent, they will follow it, head down, nose to the ground, eyes covered by their wonderful ears, oblivious to traffic and other dangers. For the same reason you need a fenced yard, you need to walk a Bloodhound on leash. Known for their stubbornness, Bloodhounds need an owner who is firm, loving, and consistent. 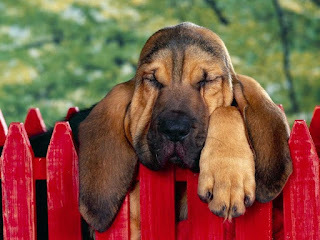 A Bloodhound who is mistreated or feels he is mistreated will pout and hide. 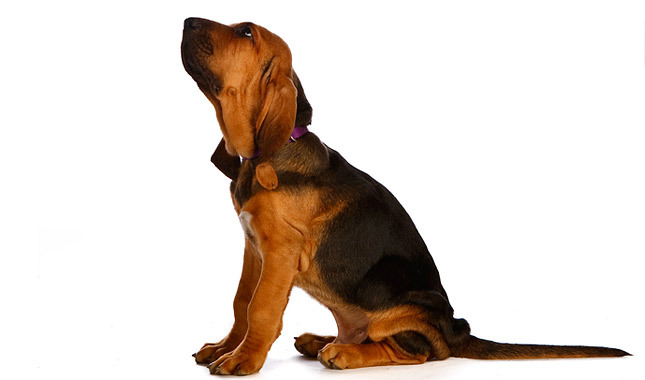 Bloodhounds do well with positive reinforcement training. Bloodhounds are prone to recurring ear infections. Routinely check their ears and clean them on a regular basis. Bloodhounds will chew and swallow the most unimaginable items, from rocks and plants to batteries and TV remotes. When they're not following a trail, Bloodhounds prefer to live indoors with the family. 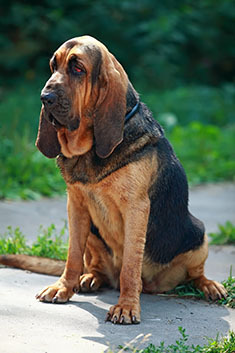 Bloodhounds descend from the St. Hubert hound, developed more than a thousand years ago in France. Bloodhounds are not lazy. They are bred to follow a trail for hours on end and nothing pleases them more. When they get bored, they are hugely destructive. game in the ritual of the hunt. The dogs take their name from the care taken in recording their ancestry, or bloodlines, so they were “blooded” hounds. Today’s Bloodhound descends from the St. Hubert hound, created in eighth century France to follow difficult trails in search of treacherous game such as wild boar. William the Conqueror brought St. Hubert hounds with him when he conquered England in 1066, and it was there that the Bloodhound eventually blossomed, some 800 years later. The Victorians were famous for creating dog breeds as we know them today — previously there had been no breed standards and rarely any record keeping of bloodlines. The rise of dog shows and a widespread interest in the keeping of fine or rare animals helped to save many breeds from extinction. The Bloodhound was one of them. His ability as a mantrailer, and the patronage of Queen Victoria, herself a noted dog lover, saved him from fading into oblivion. 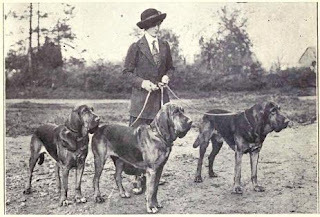 Mantrailing with Bloodhounds became a popular leisure activity, and it didn’t take long before the police recognized the Bloodhound’s usefulness in tracking down criminals. These days, the Bloodhound is still a favored member of many law enforcement teams. His testimony is even accepted in court. The dignified Bloodhound is a study in contradictions. He's docile yet stubborn, determined but not quarrelsome, affectionate but somewhat shy with people he doesn't know. When it comes to training, he's sensitive to kindness or correction, but he still wants to do things his way. He can sniff out the slightest hint of a trail, but as a watchdog or guard dog, he's poor, given his love of people. Some Bloodhounds can be vocal, barking up a storm when they're excited. Others are nice and quiet. Like every dog, Bloodhounds need early socialization — exposure to many different people, sights, sounds, and experiences — when they're young. Socialization helps ensure that your Bloodhound puppy grows up to be a well-rounded dog. The lifespan of the Bloodhound is 7 to 10 years. Some major health problems the breed is susceptible to include skin-fold dermatitis, ectropion, entropion, otitis externa, gastric torsion, canine hip dysplasia (CHD), and elbow dysplasia. 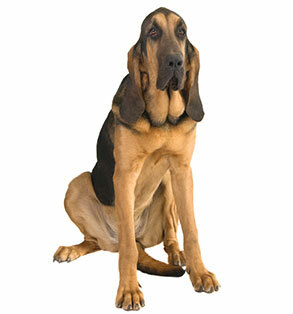 The Bloodhound also suffers occasionally from hypothyroidism. Bloodhounds can use regular exercise like any animal, but it’s also important to let them work with you in open areas so that it can sniff out scents. Letting an animal exercise in the way it was born and bred to exercise is a great, natural way to get it to live out its most instinctual behaviors in a healthy, energetic way. The most spectacular element of the Bloodhound’s behavior is its ability to track. So let your Bloodhound use that skill in the wild – it’s important for every dog to feel that it has its own unique role in your pack. Bloodhounds are popular because of its loyalty and its relatively high rate of obedience. Bloodhounds aren’t very independent dogs who like to go roaming without you. Bred to trail under any condition, the Bloodhound does not stop once it’s on a trail. Therefore, being that it needs regular exercise, it should be kept in an enclosed area when outside so that it does not go too far. The Bloodhound's grooming needs are little more than the occasional wiping or brushing of its coat , and the cleaning and removal of drool or dirt around its facial wrinkles. This breed can function as an indoor or outdoor dog, provided it has shelter and comfortable, warm bedding. Bloodhounds have short, easy-care coats in black and tan, liver and tan, or red and need only a weekly brushing or wipe down. That’s where the easy part stops. The wrinkles must be cleaned regularly and kept dry to prevent infection.Be prepared to wash your Bloodhound’s face thoroughly after every meal and wipe his mouth after he drinks water — and before he shakes his head and slings water and drool everywhere. Use a rubber hound glove to brush the Bloodhound’s short coat, remove dead hair and distribute skin oils. You can brush the dog daily or weekly, depending on your tolerance for finding dog hair around the house. Bloodhounds shed seasonally, in the spring and fall. A tool called a shedding blade can come in handy during that time to help remove the excess hair. Bloodhounds typically don’t need baths very often if they are brushed regularly. They have a distinctive odor that most people either love or loathe. If you’re a loather, don’t think you can bathe the smell away. It’s an inherent part of the dog and is something you must live with if you want a Bloodhound. Cleaning the facial wrinkles is part of grooming a Bloodhound. Depending on the individual dog, wrinkles may need to be cleaned a couple of times a week or every day. Wipe out the crud from the wrinkles with a soft, damp cloth or a baby wipe, then dry them thoroughly. If moisture is left behind, wrinkles become the perfect petri dish for bacterial growth. The rest is basic care. Trim the nails as needed, usually every few weeks, and brush the teeth for overall good health and fresh breath. Bloodhounds love children. That said, they are large, active dogs and can accidentally knock a toddler down with a swipe of the tail. They're best suited to homes with older children. In general, Bloodhounds are quite friendly with other dogs, although a few have issues with small dogs. 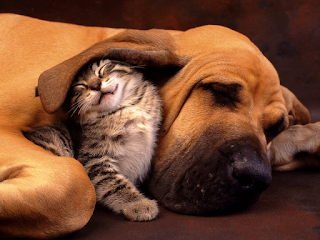 They usually get along fine with cats, although your cat may not appreciate being slobbered on. Sometimes shy, this affectionate breed will love his master for life. Because of their outstanding leadership qualities, these dogs like to be in a home where they can feel like they're the king of the roost. They're very protective of their home, but are friendly to other animals and people, making them good family pets. Due to loud howling, daily grooming needs and demanding an active lifestyle, these dogs are fit for average-sized yards or in an apartment only if given proper exercise. The name “Bloodhound” does not come from this dog’s ability to track game and people, but from a long history of carefully recorded blood lines. 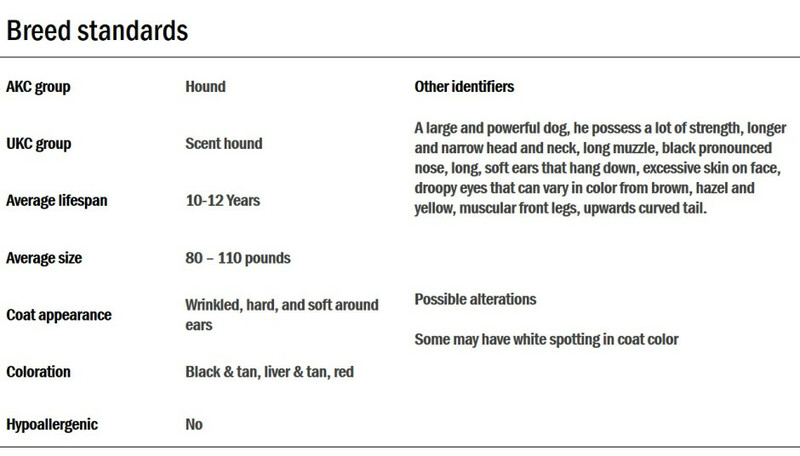 In other words, he is a “blooded” hound - a kind of dog aristocracy, if you will. Waking up on the trail to breakfast, this pup will want a little bit of loving when he first sees you in the morning. After a good sniff of his owner, he'll be ready to sniff the outdoors. After a walk and a new trail to sniff, he'll be ready for the great indoors. A few smell-downs to make sure everything in the house is in order and he'll be ready for a run in the backyard. After dinner and loving from his master, he'll enjoy his daily coat-brushing. Once he's been groomed, he'll loyally sleep in the corner of your room.